When it comes to your skin, you can make a visible difference! Look in the mirror—and smile! You can enjoy healthier and younger-looking skin! Learn how you can prevent sun damage, offset aging, and improve the appearance of your skin! It’s all in a new report that’s yours to try, risk-free! “You certainly don’t look your age!” If that’s the kind of compliment you like to hear, you owe it to yourself to see this new report from the David Geffen School of Medicine at UCLA today! In this instructive and revealing report, you’ll discover how you can safeguard your skin’s health with defenses that fight aging and keep you looking good. Plus, you’ll gain valuable knowledge about today’s latest advances against skin cancer, and other skin diseases that can cause embarrassment or discomfort. We’re living longer. That means we’re dealing with problems of aging skin far more than previous generations did. But with this increased concern have come more solutions and faster progress in treating, curing, and preventing skin diseases. Take a good look at yourself!The fact is that most age-related skin conditions are treatable—and preventable–if you take action early enough. That means learning what to look for and knowing what to do when you find an area of concern. With this Report you will gain essential practical knowledge that can, quite literally, save your skin. Skin Care: Prevention & Treatment of Skin Cancer and Other Skin Disorders has been prepared for you by the doctors and dermatologists from the School of Medicine at UCLA, one of America’s top ten medical schools as rated by U.S. News & World Report. The Report will show you how to vigilantly and effectively assess and address a potential threat to your skin’s health. “The thousand natural shocks that flesh is heir to.”Your skin gets it from both sides. Externally your skin is exposed to everything from soap to sun. Internally it can be affected by illness in another organ, by your immune system, by your diet, or even by stress. Get the authoritative 2019 report Skin Care: Prevention & Treatment of Skin Cancer and Other Skin Disorders from UCLA Health. Most age-related skin conditions are treatable—and preventable–if you take action early enough! The Report will explain how to keep your skin as healthy as possible. It will show you how to identify a skin condition, how to work with your doctor to initiate effective treatment, and how to minimize the risks that make skin susceptible to injury, illness, or premature aging. You’ll discover that there is something new under the sun. You’ll learn about the one (and only) sunscreen ingredient that gives you protection against both UVA and UVB rays. You’ll see how—for pennies—you can increase the SPF protection of the clothes you already own. And you’ll read about the results of a new study that names three skin treatments that actually do improve skin appearance. speeding the healing of eczema or seborrhea. You’ll know when to see your doctor and when an inexpensive home remedy will do the trick. And the Report will introduce you to today’s most meaningful advances in skin care and disease prevention. You’ll be told about a breakthrough vaccine that’s enabling adult men and women to dramatically lower their risk of shingles. You’ll be briefed on an innovative technique that is enabling dermatologists to reduce the flushing and redness of rosacea, a disease that affects more than 14 million Americans. And you’ll find out about a “1-2-3” treatment for relieving the symptoms of psoriasis. Is it a mole or melanoma?The average person has between 10 and 40 moles. Most moles remain harmless. But not all. Do you know the warning signs that a mole is becoming a melanoma? More than 100,000 new cases of melanoma were diagnosed in 2008, and more than 8,000 people died from this most dangerous skin cancer. In all, more than a million cases of skin cancer occur each year. But with early detection the survival rate is as high as 99%. The Report explains the three types of skin cancer. You’ll be alerted to the warning signs of a carcinoma or melanoma. You’ll know whether you or a family member is at heightened risk. You’ll get an authoritative appraisal of today’s treatment options that reduce scarring and minimize the odds of a recurrence. And, importantly, you’ll learn the eight things you can do to prevent skin cancer. 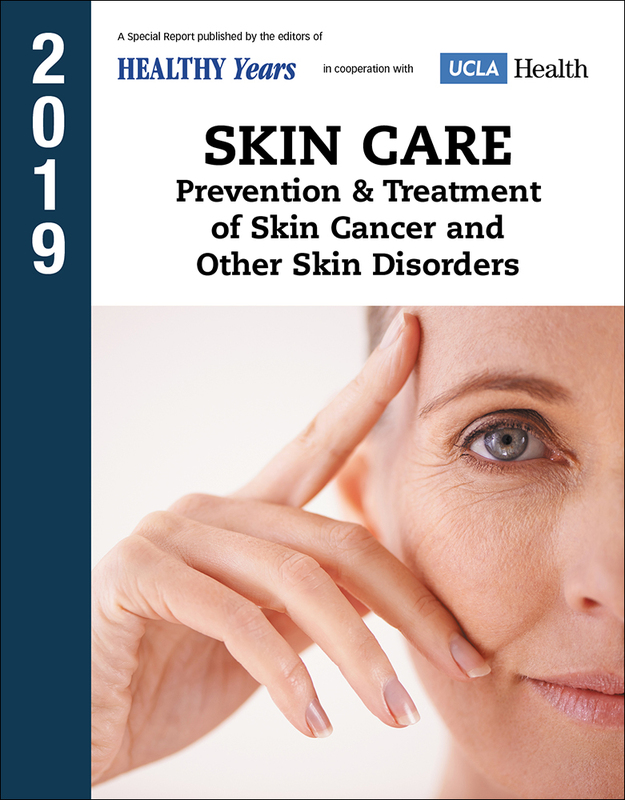 The 2019 Edition is available to you now!Skin Care: Prevention & Treatment of Skin Cancer and Other Skin Disorders is available now at the lowest price ever! A very small price for information that can make you look healthier and feel happier. After you receive the book, review and learn from it. If, within 30 days, you are not 100% satisfied with the information in the report, call, write or email us and we’ll gladly refund you your full payment. Give yourself the peace of mind that comes with knowing you’re doing the right things to keep yourself looking good! Click here to order your copy of Skin Care: Prevention & Treatment of Skin Cancer and Other Skin Disorders today! And to ensure that you stay on top of important findings as doctors and researchers continue to advance the treatment and prevention of skin ailments, we will reserve future annual editions for you on a priority basis and at our lowest price. We will notify you by postcard or email before the next edition is released and shipped to you. If you don’t wish to receive it, just return the card within 30 days. You will also be able to review each future issue before deciding to keep it.